Oh, to be here or there…Now. Photo 1: Man-made ocean-filled pool in Victoria Beach, California by danielpeckham at places wow. Photo 2: A woman floats in a swimming pool in Madrid, Spain by Daniel Ochoa de Olza / AP / wsj.com. This short film features “life” shots in Iceland, Japan, California and France. It’s wrapped in Bon Iver’s Holocene, which takes it up a notch. The video share is courtesy of Anake Goodall…a long standing blog roll member from down under – – and a man with an eye that captures my full attention with his posts each morning. This clip features Dean Potter (aka “The Man Who Can Fly“). Potter walks a highline at Cathedral Peak in Yosemite National Park as the sun sets and the full moon rises. Beautiful. Mesmerizing. Source: Thank you Anake Goodall. Be sure to check out his blog. Zeke + Buddhist Monk + Almonds = Enlightenment! 9:15 pm. June 26, 2012. 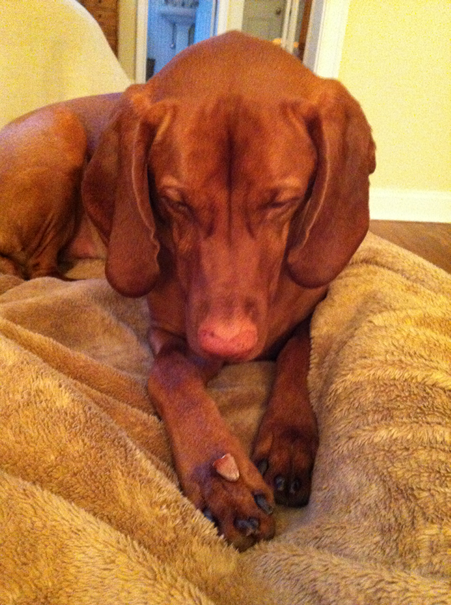 Zeke, our four-year old Vizsla, has excellent hearing and smell. But not for the bird hunting discipline that he was bred for – – but for California Blue Diamond Smokehouse Almonds. From a room away, he can hear a 1/2 turn on the top of the plastic Almond container. If he’s outside and comes inside, his nose goes 911 when he sniffs a whiff of a single nut.